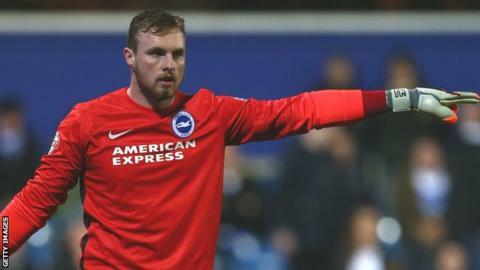 Brighton & Hove Albion goalkeeper David Stockdale says the squad must react in the right manner after their record-breaking unbeaten run came to an end. Saturday's 3-0 defeat by Middlesbrough ended Albion's run of 21 league games without defeat this season and saw them drop to third in the Championship. "The big one is how we bounce back from a loss," he told BBC Sussex. "Nobody wanted to lose this unbeaten run because it has been fantastic. The real test starts now." Brighton's unbeaten start to the campaign, made up of 11 wins and 10 draws, equals West Ham's post-war record of 21 games without defeat set in 1990-91. The Seagulls have also set a new club record of 22 league games unbeaten, surpassing their previous best from 1930-31 when they went 16 games without losing in Division Three South. "I'm happy to be here before Christmas and we've had one loss," Stockdale, 30, added. "Let's focus on the fact we've shown nothing short of brilliance to get to that. We need to take that losing feeling and make sure it doesn't happen again."